I’d love to say something profound like the 1970s was the last real decade of adult cinema but I’d need to familiarize myself with a lot more decades to be sure. I suppose that’s profound in its way. What I am sure of is that the 1970s were beholden to the golden boys of “New Hollywood,” groundbreaking filmmakers like Coppola and Scorsese who made tight-budgeted films for adults. Woody Allen also falls into that wheelhouse, although by 1978 he’d already been making movies for quite a while. Most of them were funny, though. 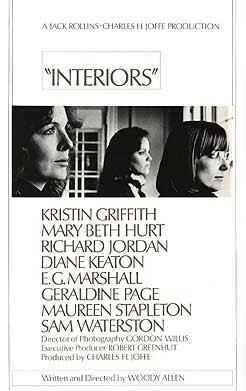 Interiors arrives in Allen’s filmography a year after Annie Hall and a year before Manhattan and it is as far removed from his slapstick as jazz is from country. It is a dour work, as sternly serious as an off-off-Broadway play and as vituperative as an angry novelist. Interiors is unique amongst Allen’s films in that it does not contain a part for him at all. It is a mostly feminine affair, concerning the lives of three young women and their relationship with their mother. That relationship is strained. Their relationships with each other are no better. Joey (Mary Beth Hurt) is her father’s favorite, a bright young woman desperate to express herself artistically but with no apparent talent of her own. She is eternally in the shadow of her older sister Renata (Diane Keaton), a successful writer, her mother’s favorite, who is in turn jealous of the close relationship between Joey and their father (E.G. Marshall). And then there’s Flyn (Kristin Griffith), the youngest daughter and a television actress, whose turmoil is invisible so far as the film is concerned, but of course that is the point. Flyn is so pretty and put together that she may as well have no interior life. Renata’s husband certainly protests as much. Each sister competes with each other for love or attention in some fashion, though all were raised under such controlled conditions by their mother Eve (Geraldine Page) that to complain to each other bluntly is not possible. They do not express themselves that way, not to each other. To their husbands or boyfriends, to one parent or the other, yes, but that should be familiar to anyone who has ever belonged to a family. This is a family of upper-class women, raised by a most upper-class woman whose mental instability has made her into a nervous ping-pong ball, bounced from one sister to the next as she tries to reclaim her status as an interior decorator following an enforced separation from her husband. She wants to believe that a report of her improved health from her daughters to her husband is all it will take to reunite them. It won’t. As you may well guess, this is not an upbeat film. The mood is one of constrained dissatisfaction. This is further exacerbated by almost every scene taking place inside beige or eggshell walls, inside houses that are as controlled and humorless as Eve’s fashion sense. Renata even experiences a profound feeling of predatory encroachment by the world outside and seems wracked with either guilt or paranoia about her mother’s illness, blaming or suffering her hereditary mania. Interiors is the brooding ancestor to Wes Anderson’s The Royal Tenenbaums and The Darjeeling Limited. The latter two films emphasize the staged nature of the drama with a vivid palette that counterbalances the navel gazing. Interiors gazes long and deeply with the monochrome color scheme of the 1970s. Even without Anderson’s signature framing, Interiors feels more like a play on film, and this is deliberate. Some distance is placed between the sisters and the camera, especially when Keaton speaks directly to the audience as though they were a therapist. These are dramatically-minded women; they’ve been raised that way. As a reviewer I have to make a judgement on whether this film is any good and that’s tricky with a film like this. It is Woody Allen’s first straight drama (and boy howdy). Interiors is an upsetting film from start to finish; never outlandishly sorrowful, just deeply unhappy – realistically unhappy. It contains characters that are disenchanted with their work, disappointed with each other, and dissatisfied with themselves – all except their father’s new wife Pearl (played by a vibrant Maureen Stapleton) who clashes so austerely with their claustrophobic world she is almost ejected from it by the force of his daughters’ disgust alone. But as I said, it is a film for adults. It’s not a feel-good movie, nor one of Allen’s acclaimed, but in its wriggling discontent there is something familiar and important reminding the watcher that these characters, unhappy as they may be, are expressing the way we feel, to people we recognize. It is a film of reflections, falling inward and looking out. I’m still trying to get Jeff to watch 8 1/2, but this is interesting because some of Woody Allen’s dramas I feel are simply not good. I mention 8 1/2 because I’m sure you’ve seen Stardust Memories, but given that I’m actually a fan of 8 1/2 and Allen claims that Stardust Memories is “a noncomedic parody of 8 1/2,” I just feel like it’s a rip-off, rather than an homage. I realize it’s a bit off topic from Interiors, but it is something that bothers me. I think the sentiment in Stardust Memories is good, but I think he should be able to find a better way to convey that. I love Woody but I actually agree. I saw Stardust about a year after I first saw 8 1/2 and it feels a lot more like he’s just remaking it rather than doing an homage. I do like his dramas though and I’d say Allen is not only one of our most authentic but also tireless American filmmakers.